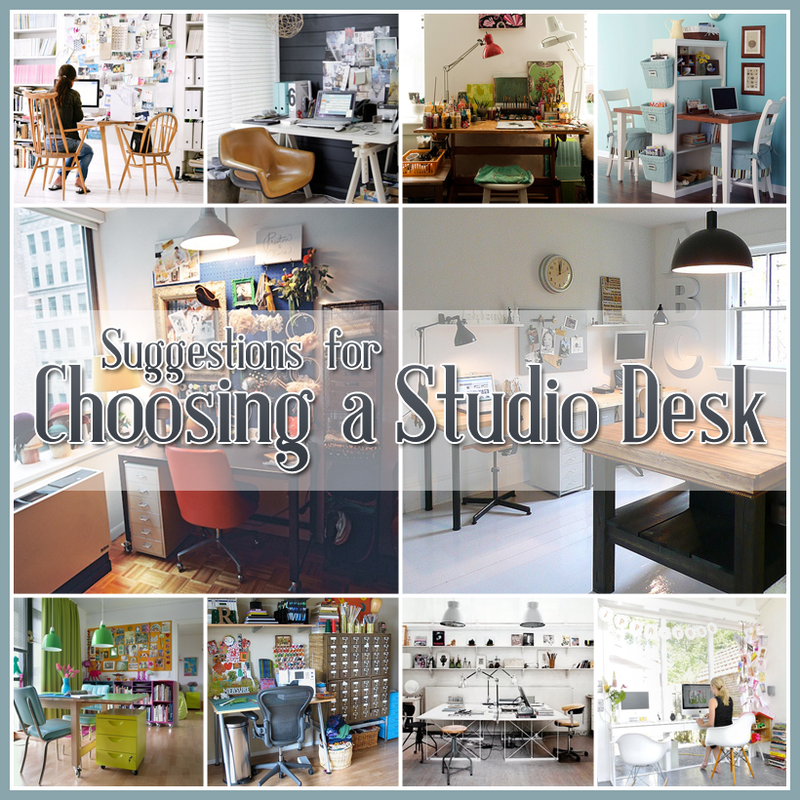 Choosing a desk for your studio? It is not as easy as picking out a desk to place your computer on…or one that is used for just paper work. I am going to explore some different options and of course I will be sharing them with you. You just might find it helpful if you are looking for a change or your first desk for that special area or room. 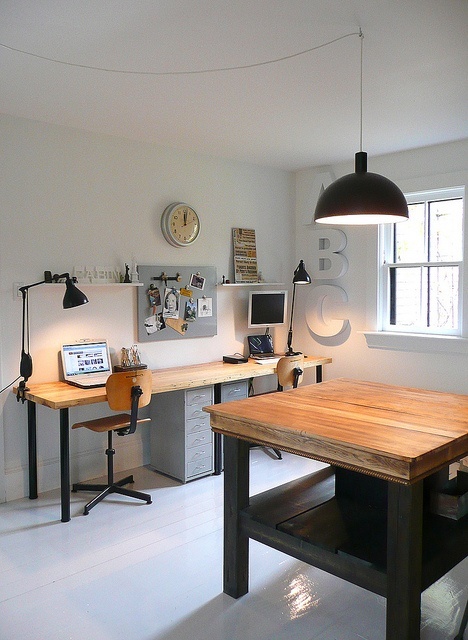 Here is wonderful desk…it is large…stylish…tons of room to work on just about any project. If you asked me a year ago if this was a desk that I would consider…the answer would be NO…there are no drawers forextra storage…but the plus side is there is open space for easy movement…and the wall of shelving provides plenty of open storage that makes the upkeep so much easier to manage. The direct lighting is fabulous. 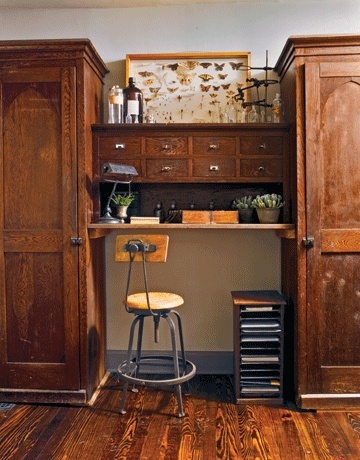 Here is a desk that is perfect if you are working with a small area. With the work horse legs…it gives you 2 shelves for easy access storage and the width and depth of the drawing board styling gives you a nice working area where you can have essentials on top and plenty of room to work. You can always add some shelving or storage cubbies to the wall along with the message board…so many options and a GREAT use of a small space. Here is another desk that is a great choice when you have a limited space for your work area. Simple lines…the height is a personal choice…many people are much more comfortable on a high stool and having a desk that perfectly meets the height is a great thing. This can fit just about anywhere…perfect for an apartment…nook…or just about any where! 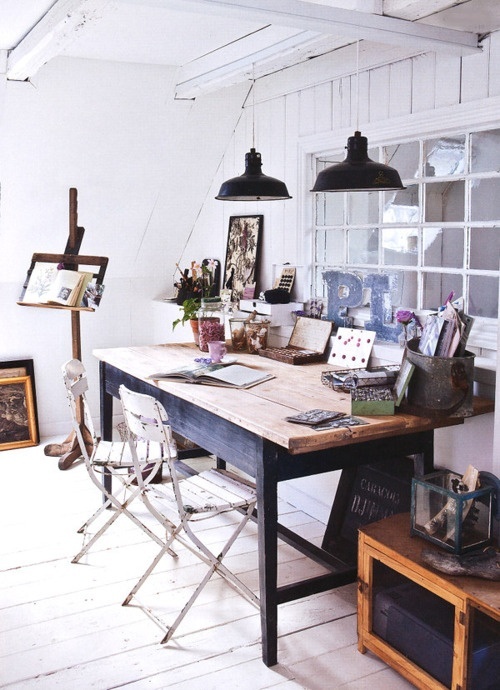 I love the artsy flair of this area…this is a vintage drawing board which offers you a variety of height and slant which might be something that you would enjoy at times. With the simple addition of a side table more easy to reach storage is provided. 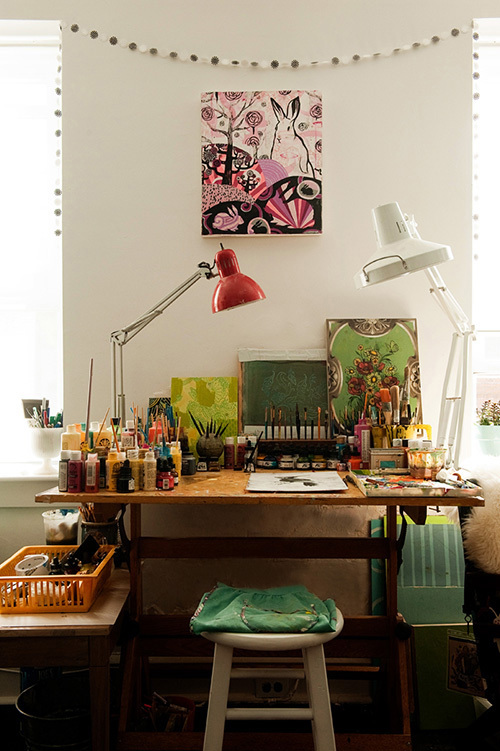 You should see some of the creations that are made right here at this desk and you will see that it is a perfect space for an artist of any kind! Once again…perfect for a smaller area. Here’s a simple desk that provides plenty of space for a work area and your computer. When I saw this arrangement…it was not all about the desk…it was more about where it was placed. 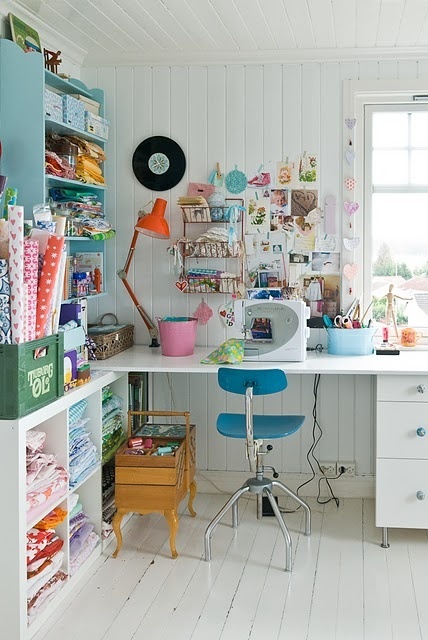 I am now rethinking the placement of my personal work area…just didn’t think of arranging it directly in front of a windowed or sliding door area…but if it does not conflict with the actual door opening it could be a possibility and one with a view! Now if you are choosing for two : ) Here is a great idea…having two simple tables side by side. You can even purchase 2 sturdy inexpensive folding tables and have at them with your style and of course a bit of paint! A great layout for easy communication with your workmate. The idea of redoing a folding table can work very nicely singularly also. This is a nice open desk and with the overhang…you can slip a cool filing cabinet underneath with casters so you can also have an open area if you need it. A simple solution for storage and a nice work area. 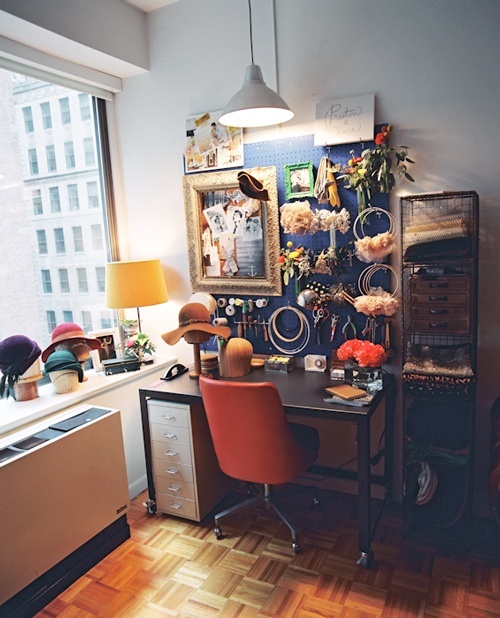 Now here is workspace that shows us that any space can be functional and fashionable. 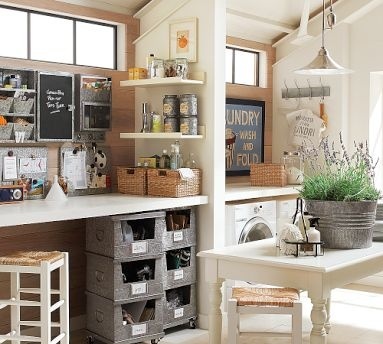 A table top…industrial bins…great accessories and voila! Then in this studio/laundry room you are provided with the additional table that is great for folding clothes or an art project. A brilliant use of space. I am loving this desk. Large…open…and also provides a drawer area that can be used for paperwork and item that are not used regularly. The placement is also great another thing I am considering with my own space…It is now facing the wall…but seriously thinking of rearranging it in this fashion. 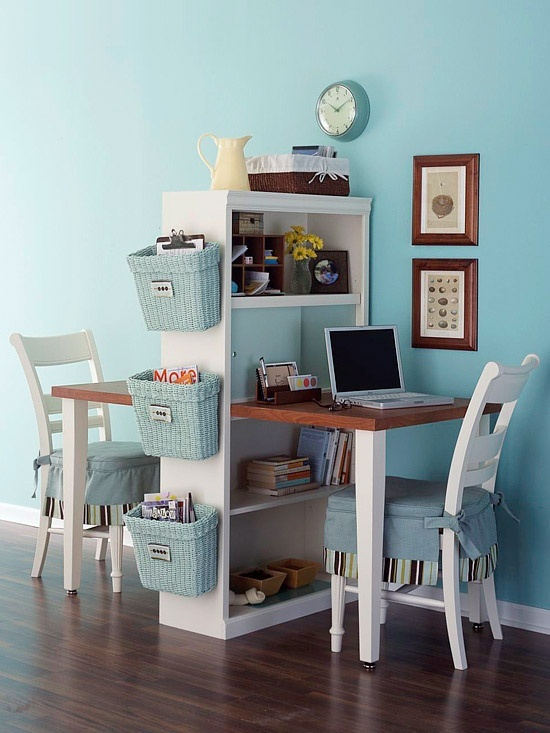 This desk is great if you have room for it and it provides plenty of space for any kind or creativity. Once again the saw horse style desk…only a bit larger this time works great just about anywhere you put it. With amble storage space for all of your supplies and items…it is a great option. Limited space? It doesn’t seem to stop this Milliner from designing and creating some fabulous hats. The desk has a great multi small drawer cabinet attached (love the smaller drawers…thing can’t be buried so easily — says someone that KNOWS! : ). The large pegboard provides easy access storage…the shelving ledge is also a great place to display some fashionable wares! So compact but SOOOO functional. This is a perfect example to look for the small details that apply to you and your needs. Here’s a cute idea for an area with limited space. 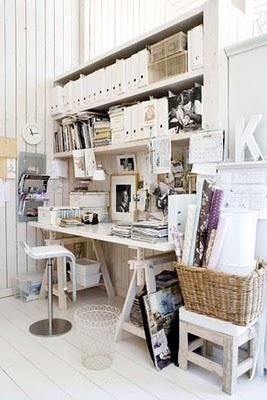 Wire shelving…a simple desk with a curtain added to hide some extra items. You have a whole creativity dashboard in about 4 feet of space! This desk style is perfect for this sewer. 3 graduated drawers…open leg area so the foot pedal to the sewing machine can sit unobstructed…plenty of room for the machine and accessories. Fits perfectly in a corner area to make the best use out of the space. Clever space that can be tucked in any room or space…by taking a bookshelf as a divider…your can create one of these with a bit of building talent and power tools. You can also make one that the book case is towards the wall and a singular desk…one way or another…it’s a great use of a small space with maximum storage potential. Perfect for a kitchen! You can do a craft project here…use the area to work on your laptop…blog…the list goes on! The pretty wicker baskets are a great touch and oh so funtional! Simple…functional…fashionable and plenty of space. The use of wooden crates for storage is fabulous. 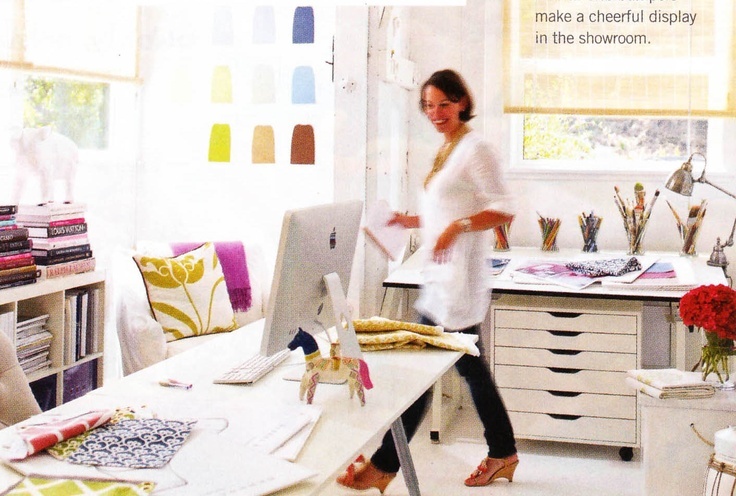 Remember…think about what you are using your desk space for…it is so important in the decision making process! Who says that a desk can’t be a table! Any size…any shape…bet that there is one perfect for your needs. The great thing about a table is that many are easy to build and if you are lucky…you can find many of them at Good Will or Garage Sales! Oh the possibilities…add some eclectic chairs and you have a little work of art before you start your project. This is also a GREAT idea when you share your space with your kids! 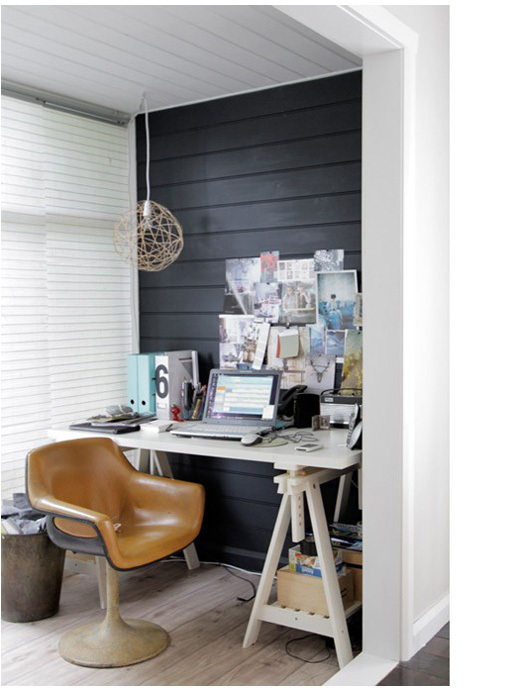 A large stylish desk…clean and crisp…easy to clean and multifunctional! 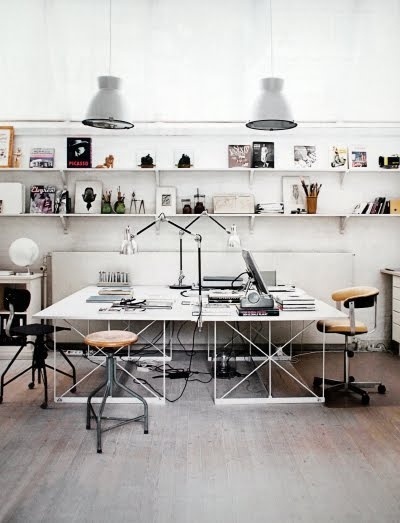 Simple lines…can be arranged for 2 people or just one with rearranging the filing cabinets below…great work space! With all of my searching…I think I have a good idea now what I want for my studio area…Here is a good sampling…a large table type desk with a top drawer…no drawers on the side so I have plenty of room to move around (I am someone that always thought…drawers…drawers…drawers…but I am going for open space this time because I truly do not like to be confined and the TRUTH be told…I am a stuffer!!! I know that I will not have a hutch type piece on the desk for storage either…I need a wide open space and that will make me a much happier little camper! The lighting that is suspended from above and shining directly on the work space is perfect…I am going to move away from the desk lamps that are either fasted to the desk or sit on top of the desk…the over head allows me to have more work space. I also think that I might place the desk that a portion of it faces the sliding glass door and deck for a bit of a view that is sometimes very needed. 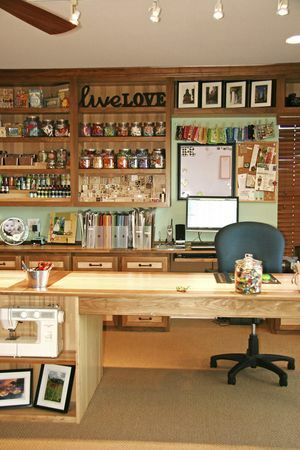 Shelving…creative storage space…peg board…etc. will allow for the storage. I do believe that is what will suite my needs and I hope by checking out all of these options and more it will help you know what is right for you! How wonderful that you posted this today! Over the weekend I decided to get rid of my big old Hamilton oak drafting table and outfit my studio with lower work surfaces and a new drawing table! I am so glad to see all of the options you’ve shared! Thanks! Thanks for the inspiration! I hope you share you new studio space while working on it. I’d love to see your home too! Would you make a home tour?